Be the first to share your favorite memory, photo or story of Kunjamma. This memorial page is dedicated for family, friends and future generations to celebrate the life of their loved one. 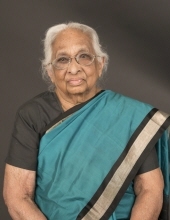 Mrs. Kunjamma George (91), who hails from Parapattu family, Mulakuzha; was born on September 28, 1927 to Mr. P.G. Idiculla and Annamma Idiculla. She was the middle child of the three siblings. She did her early schooling in Chengannur and completed her Bachelor’s in Botany from CMS College in Kottayam. She was married to T.E. George (Thundiathu, Aranmula), who was a professor at St. Thomas College, Kozhencherry. She was a teacher for a short period of time and gave up her professional career to become a full-time mother. She was blessed with three kids: Geetha, Biji and Shibu. She has five grand kids and one great granddaughter. Her husband passed away in 1976. After all the kids moved to the U.S.; in 1996, she joined her younger son in Colorado. She was a very active member and participated in church activities, both in Kerala as well as in Colorado. We are thankful for the blessed life she has had in this world and look forward to meeting her one day in our heavenly abode. To send flowers or a remembrance gift to the family of Kunjamma George, please visit our Tribute Store. "Email Address" would like to share the life celebration of Kunjamma George. Click on the "link" to go to share a favorite memory or leave a condolence message for the family.